Kick off your visit on the 28th (Tue): take in a show at Arena di Verona, take in the exciting artwork at Galleria Dello Scudo, take in panoramic vistas at Torre dei Lamberti, then take a stroll through Piazza delle Erbe, then take in the architecture and atmosphere at Basilica di San Zeno Maggiore, and finally contemplate the long history of Museo di Castelvecchio. Get ready for a full day of sightseeing on the 29th (Wed): see the interesting displays at Casa di Giulietta, then see the interesting displays at Fondazione Museo Miniscalchi-Erizzo, then pause for some serene contemplation at Chiesa di Sant'Anastasia, and finally admire the masterpieces at Museo Canonicale. For ratings, where to stay, photos, and tourist information, read Verona online road trip planner . Sao Paulo, Brazil to Verona is an approximately 17.5-hour combination of bus, flight, and train. You can also do a combination of bus and flight; or do a combination of bus and flight. The time zone difference when traveling from Sao Paulo to Verona is 4 hours. Traveling from Sao Paulo in May, expect little chillier with lows of 13°C in Verona. Finish your sightseeing early on the 30th (Thu) to allow enough time to drive to Venice. 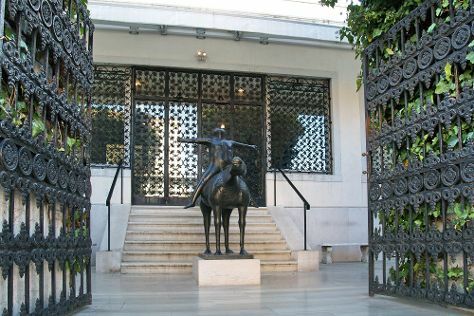 Appreciate the collections at Peggy Guggenheim Collection and Gallerie dell'Accademia. Basilica di San Marco and Scrovegni Chapel will appeal to history buffs. Go for a jaunt from Venice to Padua to see Basilica di Sant’Antonio about 54 minutes away. The adventure continues: explore the activities along Canal Grande, admire the landmark architecture of Doge's Palace, take in the architecture and atmosphere at San Giorgio Maggiore, and examine the collection at Museo Ebraico di Venezia. To find traveler tips, ratings, more things to do, and more tourist information, read Venice online trip builder . Traveling by car from Verona to Venice takes 1.5 hours. Alternatively, you can take a bus; or take a shuttle. Expect a daytime high around 26°C in May, and nighttime lows around 15°C. Wrap up your sightseeing on the 4th (Tue) early enough to drive to Trieste. Start off your visit on the 5th (Wed): don't miss a visit to Molo Audace, contemplate the long history of Castello di Miramare - Museo Storico, then examine the collection at Civico Museo della Risiera di San Sabba, and finally take a stroll through Citta Vecchia (Old City). To find where to stay, reviews, traveler tips, and tourist information, you can read our Trieste online trip maker . You can drive from Venice to Trieste in 2 hours. Other options are to take a shuttle; or take a bus. June in Trieste sees daily highs of 32°C and lows of 21°C at night. Finish your sightseeing early on the 5th (Wed) so you can drive to Zagreb. On the 6th (Thu), take a stroll through Upper Town (Gornji Grad), contemplate in the serene atmosphere at St. Mark's Church (Crkva sv. Marka), examine the collection at Zagreb 80's Museum, then contemplate in the serene atmosphere at Porta di Pietra (Kamenita Vrata), and finally see the interesting displays at Museum of Broken Relationships. Here are some ideas for day two: test your problem-solving skills at popular escape rooms, stroll the grounds of Mirogoj Cemetery, then examine the collection at Tortureum - Museum of Torture, then make a trip to Tkalciceva, and finally admire the landmark architecture of Cathedral of the Assumption. To see more things to do, where to stay, reviews, and more tourist information, you can read our Zagreb trip planner . Traveling by car from Trieste to Zagreb takes 2.5 hours. Alternatively, you can take a bus. Expect little chillier evenings in Zagreb when traveling from Trieste in June, with lows around 15°C. Cap off your sightseeing on the 7th (Fri) early enough to go by car to Budapest. Your cultural itinerary includes sights like Matthias Church and House of Terror Museum. Museum-lovers will get to explore Hungarian National Gallery (Magyar Nemzeti Galeria) and Hospital in the Rock. Go for a jaunt from Budapest to Szazhalombatta to see Archaeological Park about 36 minutes away. And it doesn't end there: steep yourself in history at Fisherman's Bastion, test the waters at a local thermal spa, get a sense of history and politics at Parliament, and browse the exhibits of Hungarian National Museum. To find photos, reviews, other places to visit, and other tourist information, read our Budapest journey builder . Getting from Zagreb to Budapest by car takes about 3.5 hours. Other options: take a bus; or fly. June in Budapest sees daily highs of 30°C and lows of 15°C at night. Finish up your sightseeing early on the 13th (Thu) so you can catch the train to Vienna. Deepen your sense of the past at sights like Belvedere Palace and St. Stephen's Cathedral. Appreciate the collections at Kunsthistorisches Museum Wien and Judenplatz Holocaust Memorial. There's still lots to do: admire the natural beauty at Schonbrunn Palace, contemplate in the serene atmosphere at Karlskirche, see the interesting displays at MuseumsQuartier Wien, and explore the world behind art at Leopold Museum. To plan Vienna vacation without wasting time, ask Inspirock to design an itinerary. Traveling by train from Budapest to Vienna takes 2.5 hours. Alternatively, you can drive; or take a bus. In June, daily temperatures in Vienna can reach 29°C, while at night they dip to 15°C. Wrap up your sightseeing on the 19th (Wed) to allow time to travel to Prague. Do some cultural sightseeing at St. Vitus Cathedral and Old Town Square. Let the collections at Jewish Museum in Prague and Strahov Monastery capture your imagination. Next up on the itinerary: get to know the fascinating history of Prague Castle, get the lay of the land with Walking tours, explore the world behind art at St. George's Basilica, and contemplate the long history of The Powder Tower. For photos, more things to do, where to stay, and tourist information, refer to the Prague trip planning site . Getting from Vienna to Prague by flight takes about 3 hours. Other options: drive; or take a bus. When traveling from Vienna in June, plan for little chillier days and about the same nights in Prague: temperatures range from 26°C by day to 15°C at night. Finish your sightseeing early on the 25th (Tue) so you can travel back home.